As the leading arborist, tree trimming, and general tree company within Fairfax and Loudon County and the surrounding areas, it’s no coincidence that we have been accredited by the Tree Care Industry Association and are recommended by Angie’s List members for our many services that include tree cutting, stump removal, tree fungus treatment, and even emergency tree removal. Since 1976 we have been providing exceptional tree pruning services to Ashburn and other Virginia communities. In today’s post, we are going to highlight our four primary tree care services that we are proud to offer at Growing Earth Tree Care. By no means is this the extent of our offerings, but our “bread and butter” is certainly tree and stump removal, tree pruning and cutting, pest and disease control, as well as our soil and roots service. We will focus briefly on each service so that you can have a better understanding of what to expect should you choose to work with Growing Earth Tree Care. There is a reason why people say we are Northern Virginia’s top team of certified arborists who are exceptional when it comes to tree and stump removal. Typical reasons for removing a tree include the death and decay of a tree. If you find yourself in a situation that where there may be a safety risk, we encourage you to have our team of tree surgeons assess your situation and provide you with our professional recommendation. We have 40 years of experience, so why not use the resources that are available to you? Keep in mind we also provide emergency tree removal as a service. Don’t hesitate to reach out to us for matters big and small. Did you know that you shouldn’t prune more than 25 percent of the branches from a tree during one season? If you did, congrats! If you are like most people and didn’t know that, it is another example of the kind of expertise we provide as “tree doctors”, if you will. We will put together a plan once we assess the stability and health of your trees to determine the most viable options moving forward. For some, growth regulators are excellent options to reduce the need of frequent tree trimming, in addition to improving the overall health and stability of your tree. 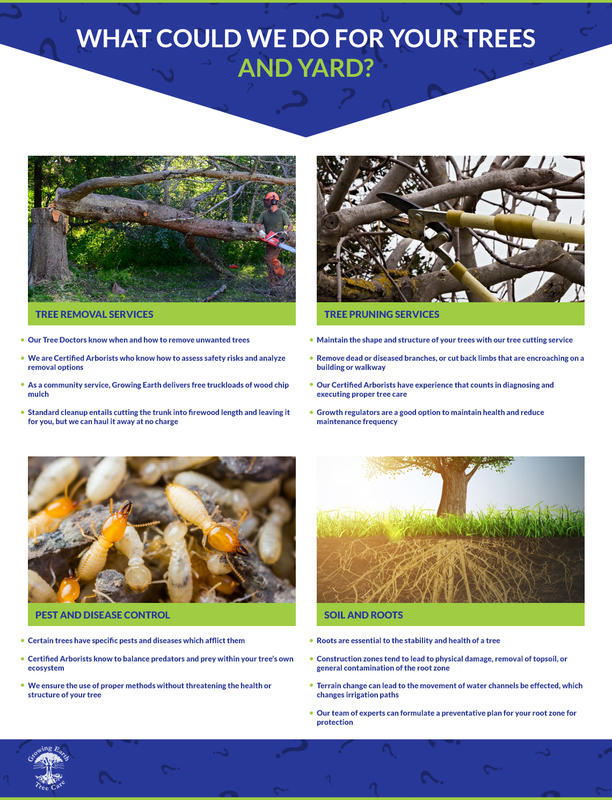 As many of us have at some point experienced, tree pests and tree diseases can be a real bummer when it comes to your yard and the health of your trees. Unfortunately the solution to a pest problem isn’t as simple as running to your local grocery store and picking up some bug spray. While it might be a cathartic experience to cover the bugs in poison, it likely won’t have the desired effect. Each kind of tree has their own specific pests and diseases which come along with it, and to that end our team of tree arborists are skilled in analyzing areas of concern and formulating long-term solutions. We know that it is important to keep the predators and pests in balance. So it might not be in the best interest of the long-term health of your trees to eradicate an entire population of pests. That’s where we come in to determine the best option. Construction zones can create a real problem for areas in which you would like to grow a grouping of trees. This can often get overlooked when homeowners are finishing construction on their house, because there are plenty of other things to worry about at a time like that. But issues like physical damage to existing trees caused by equipment, topsoil contamination, and irrigation pathways changing due are all examples of hazards which can arise more often than you’d think. It’s a good idea to post clear signage coupled with protective, silt fencing installed around the perimeter of the root zone in question. If the unavoidable circumstance arises where a root zone is directly under the construction area, it’s wise to layer a temporary layer of wood chip mulch (around a foot deep, if you can get that much) in order to preserve the integrity of the root area. Of course, each situation is different, so it’s also wise to consult with your local tree company Growing Earth Tree Care before trying to handle it all on your own. Let us handle your current and future trees, while you focus on moving into your new home! At the end of the day, there are plenty of reasons why getting a free quote for a tree care service is a good idea. Taking advantage of our 40 years of experience in understanding the North Virginia climate is what more and more people continue to do. With summer right around the corner, make sure you and your yard are set up for success and health for this season and those that are to come. Serving Loudon County, Fairfax County, McLean, Reston, Ashburn, and even Arlington, get your free estimate today!